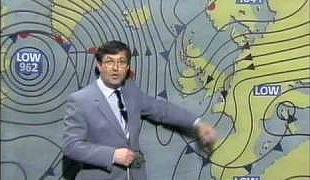 This is that infamous 80s weather blooper (in 1987) when Michael Fish forecast that there wouldn't be a hurricane. Unfortunately, on the evening of October 15th/16th the great storm of 1987 descended upon the southern half of the UK. Of course, technically it wasn't a hurricane, but there were hurricane force gusts, so stating that the weather would be "very windy" was a bit of any understatement to say the least! In his defence, Fish had actually predicted a storm but just not in the right place. He forecast that the storm would move further south along the English Channel and the British mainland would escape the worst effects. This remainder of his warning is frequently left out of re-runs, and was left out of the video clip above. BILL GILES HOURS BEFORE THE STORM! Here's proof that Michael Fish was made a bit of a scapegoat. This is BBC weatherman Bill Giles forecasting that it would be "very breezy up the channel" just hours before the great storm struck the UK! Hmm, seems he got off lightly! Whatever happened to TV-am weather girl Wincey Willis?